The standalone smartwatch has been something of a dream for smartwatch enthusiasts. Imagine finally being rid of your phone, that metal and glass slab you just can't stop using. We've seen some movement towards that with devices like the LG Watch Sport and Apple Watch Series 3, but maybe we're missing something? Shell Wearables certainly thinks so. The company's smartwatch, the Shell, which drops on Indiegogo for $250 on 31 January, is an attempt at a brand new idea. 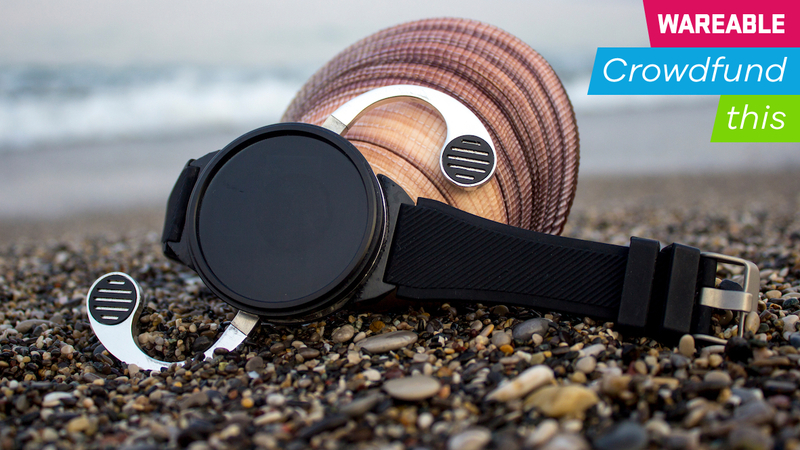 The Shell doesn't just want to be a smartwatch, it wants to be a smartphone too. In fact, it can completely detach from the wrist dock. When it does, you'll see two wings spring out from the sides, but no, it's not a James Bond gadget, just a phone. See, those wings are actually antennae that double as both the microphone and speaker. The idea is that you can simply hold up the Shell to your head and talk as you would on a phone, but with an odd form factor of a circle with two wings sticking out. There's also LTE data, GPS, Wi-Fi, Bluetooth and support for NFC payments. The Shell runs on Android Wear 2.0, too. So when you pop into "smartphone" mode, be sure to know that you will be running your life from Android Wear, not proper Android. You're not really getting a proper smartphone experience when you pop it out of its holster, you're just holding an unbuckled smartwatch to your ear. Azar Talibzade, founder of Shell Wearables, tells us that there were a couple of big ideas that inspired him and his team to create the device. First, they found it impractical to actually use their smartwatches as phones, because you either ended up talking to your wrist or had to use a Bluetooth headset. However, most people tend to treat calls on the wrist as speakerphone calls, and don't necessarily hold their wrists up to their mouth unless there are connection issues. People generally use Bluetooth headsets to speak via their smartphones, too. Battery life is also an issue with smartwatches, but Talibzade says Shell can deliver 120 hours of standby use, eight hours of audio, four hours of video and five hours of talk. Finally, the Shell also has a 12MP camera that Talibzade says is "selfie friendly", which most smartwatches can't claim as they generally don't have cameras at all, let alone front-facing ones. However, from the video, it appears that the camera is some sort of add-on that you have to clip to the wings rather than something that's always on the device, partly defeating the purpose of an ever-ready camera. It's also unclear why you wouldn't just keep around a smartphone, which typically have great cameras, even better editing apps and multiple ways to upload and share them – all things smartwatches can't do. Regardless, Shell Wearables believes that to build a true standalone smartwatch, someone needs to shatter the idea of what a smartwatch is. "Large companies are mostly concentrated in maximising the use of the standard watch shape," he says. "They're currently trying to improve technical specs and parameters like screen resolution, battery, and processor. While these goals are great for the industry as a whole and perfectly fine for users who just want a smartwatch, we believe that the perceptions of what a smartwatch should look like need to change in order for us to achieve a true standalone wearable." True standalone wearables need a lot of battery life to keep going, which is difficult because the form factor is too small for a large battery. Shell is getting around this by including a manual generator. You squeeze the wings in rapid succession, kind of like a mini accordion, to generate some power to keep your watch going. Three to five minutes will get you the same amount of talk time. You can charge the Shell in a more traditional version, leaving the squishy power generator as a last-ditch emergency effort. Otherwise, it seems unlikely anyone will ever spend five minutes manually generating power for their smartwatch – especially if their smartphone is ready to go. Or are we just out of touch? But what happens if you've already got a smartwatch, like an Apple Watch or Gear S3? Well, Shell has a solution for that, too, in case you want to add substantial bulk to your wrist. It's the $150 Universal edition, which is a Shell that lets your current smartwatch slot in. Save for using the generator to juice your smartwatch back up, all the Shell's features will work with your current smartwatch over Bluetooth and Wi-Fi. If you need a more rugged solution, there's also the $400 Commando edition, which Talibzade says is military grade. It also comes with a square watch face instead of the regular circle one, which – by the way – has a flat tire. A question that will normally keep you up night after night, but not this time. Talibzade says the Shell Wearables team is made up of people who have experience in working on both wearables and smartphones, and it's certainly confident that its unique design will appeal to people. However, Shell Wearables also doesn't have experience in crowdfunding, and with a device as complicated as the Shell – in three separate varieties – it could be difficult for it to ship things on time. Currently, it's planning on shipping in either October or November. But while it has some interesting ideas about what a smartwatch should be, it also feels like a product that the vast majority of people are never going to use. If you're desperate for a standalone smartwatch, then the Shell isn't going to solve your problems. Sure, maybe it'll be better for phone calls if you're allergic to both Bluetooth headphones and speakerphone calls, but it's still running Android Wear when in phone form. Standalone smartwatches might be getting better, but they're still not ready to replace our phones – and the Shell smartwatch doesn't seem to break that trend.